It takes years. Seriously. 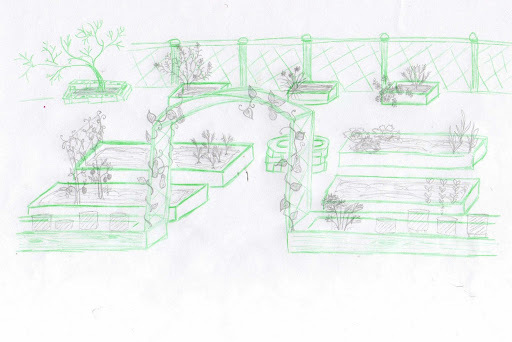 To create a backyard homestead. Just one step at a time with lots of patience and ingenuity thrown in for good measure. When we bought this house it had a big yard, with lots of landscaping and almost no ‘useable’ space. Plastic covered the ground. Under the dirt, between the bushes and trees, around the beds. It was all covered in plastic. We removed as much as we could, and also removed completely unusable plants like ivy, bushes that were overgrown and dying, and tons of grass. 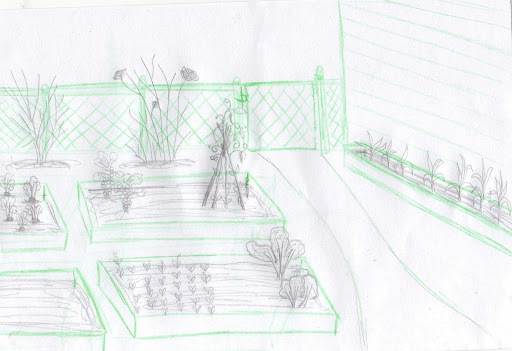 In March 2010 - I drew up pictures of what I wanted my future garden to look like. Although it looked NOTHING like my yard of the house that I had just bought. I wasn’t sure I would ever get to a place where I would have the dream I wanted. But I now realize that it just took work and a lot of patience. I knew it would be work, but over the years I have seen a lot of that dream realized and today I can say that I am almost there. Here is the other side of the garden that has also been transformed from somewhere ugly into a beautiful and useable space. This year we have taken it to a whole new level. My 16 year old is able to help and he has gotten very good at it! More hands make lighter work. We have done a lot this year so far, and I have more plans that I am ready to put into place. But first, I was compelled to draw them out. I haven’t gotten a whole lot more sophisticated with my design materials. I still enjoy using my own hands and colored pencils to map out the details of what I want to do. But already this is so much better than it was just a few months ago that I feel as though it will not be long before this dream, too, is realized. Notice a few added details. The garden bed beneath which will be the home for the lavender plants from the front of the house, which I am slowly replacing with blueberry bushes. The clothesline with inspiration that came from Homestead Revival’s own HOA friendly clothesline design. The chicken run, which will have a nice door and fence surround that leads up to the 8 ft fence behind it to keep my girls safe from the neighbors new puppy. All of these things don’t exist yet. But I no longer have any doubt that they will. And I am enjoying dreaming of a day where there will be an ‘after’ for this section too. Because it won’t be long. I absolutely LOVE what you're doing. We're just beginning, bit by bit, to do the same thing. So excited to see where it will be in a few years.